Very articulate & strong-willed child. She's furious. It's good to see she filed a complaint against her family selling her off for money or barter. Hope she sets an example & the authorities act on it! She wants her education & freedom. At least she's infomed about her rights. Eating cheese before falling asleep, Helps you fall asleep faster & better. Well at least now I know why I was having nightmares, look I will allow you this pleasure only because England rarely gets the chance to boast about anything else!!!! Darts, theminis. They excel at darts. As played in pubs. The other sporting incidents Jo mentioned were ... flukes. about the second Ashes Test Match. Don't think she'd be following rugby league, sparkie. Bet Russell Crowe is upset, though. This NSA whislteblowing matter that ED Snowden has brought into the limelight is becoming a major source of contention in the US. WASHINGTON — The secret Foreign Intelligence Surveillance Court renewed the government's authority Friday to continue the collection of millions of Americans' telephone records, one of the classified counter-terrorism programs disclosed by former National Security Agency contractor Edward Snowden. In an unusual public statement, the Office of the Director of National Intelligence acknowledged that the court renewed the authority that was set to expire Friday. "In light of the significant and continuing public interest in the …collection program, the DNI has decided to declassify and disclose publicly that the government filed an application with the Foreign Intelligence Surveillance Court seeking renewal of the authority to collect telephony metadata in bulk, and that the court renewed that authority,'' the statement said. Earlier this week, Democrat and Republican lawmakers expressed deep concerns about the scope of the surveillance program and suggested that Congress may not renew legislative authority for it when it comes up for review in nearly two years. "This is unsustainable, outrageous and must be stopped immediately,'' Rep. John Conyers, D-Mich., told Justice and intelligence officials at a Judiciary Committee hearing Wednesday. Snowden has been charged with espionage related offenses for disclosing the program and a separate operation that tracks the communications of non-U.S. citizens abroad. He has been in a Moscow airport weighing various asylum strategies to avoid extradition to the United States. Incidentally the UK equivalent, the GCHQ is dragged into it too. What next Interpol, ASIO?? Juliette Hardy wrote: Don't think she'd be following rugby league, sparkie. Rusell Crowe is an idiot he was quick to point out when the Aussies loss the first Test that he was a Kiwi so I doubt he would be that upset, he sold his stake in Souths bet he's sorry now! Juliette Hardy wrote: This NSA whislteblowing matter that ED Snowden has brought into the limelight is becoming a major source of contention in the US. Yes I have been following it, sort of in two minds about the whole thing. And whom may I ask is the head of GCHQ? Ok I'm sending to you 7.7 Degrees please return in kind but up it by 20-25 I can handle it. This is a big thing in Germany too. Apperantly the NSA spyed on the German goverment too. Our chancellor wants answers from the US goverment but of course the US will never give that. It is all about national security. Sorry your team got eaten by the dragon sparkie. My soccer team had a rotten season so hoping for a better one when it starts next month. Joanna wrote: Sorry your team got eaten by the dragon sparkie. That's because he's proud of his cousins Jeff Crowe & Martin Crowe being NZ players, I guess. Ok so tomorrow morning when the sun rise I will have a serious word with Mrs Sun and giv e her the direction to Oz. Maybe you get lucky. Thanks Nicky - well the cold does wake you up so at least that's one good thing. His name is Iain Lobban. The acronym is Government Communications Head Quarters & it's closely linked to MI6. UK version of NSA. The Australian one would be ASIO, I guess. Italian is SISMI. They all do a lot of online surveillance, like internet policing & monitoring. I think any country that is complaining about being spied upon but has spy organizations should really just shut up and go about their business. They're all doing it. They're just pissed that the US is probably doing it better and they weren't aware it was happening to them too. Everyone should really be afraid of the Chinese. They are spying to steal secrets on how to make thing so that they can rip them off and make them cheaper in their sweatshops. The Australian one would be ASIO, I guess. They do a lot of online surveillance, like internet policing & monitoring. Well that just show how stupid I really am I thought it was "George Clooney Head Quarters"
Well we need agencies such as ASIO, the like of which don't bother intruding of the average Joe or Joanna, they have a pretty good idea of what and who to look out for - I have no problem with a little bit of intrusion if that's what it takes to catch the real baddies. Anyhow my experience is people with nothing to hide, hiding nothing so Im not bothered. theminis wrote: Well we need agencies such as ASIO, the like of which don't bother intruding of the average Joe or Joanna, they have a pretty good idea of what and who to look out for - I have no problem with a little bit of intrusion if that's what it takes to catch the real baddies. Thanks Sparkie, on that positive note, farewell from me, have to get up at 6.30am tomorrow, kids to school then the gym - you will hear my muscles protesting from this continent to the next! LornaDoone wrote: I think any country that is complaining about being spied upon but has spy organizations should really just shut up and go about their business. They're all doing it. They're just pissed that the US is probably doing it better and they weren't aware it was happening to them too. At the MCG tonight (Melbourne Cricket Ground) - 95,000 fans sang You'll Never Walk Alone - video quality not the best. I have to share my day with you. I was on the road , driving ...and I past through a village which had a bakery. So I stoped because I had to go to the toilet. I drunk so much water I really needed to pee. 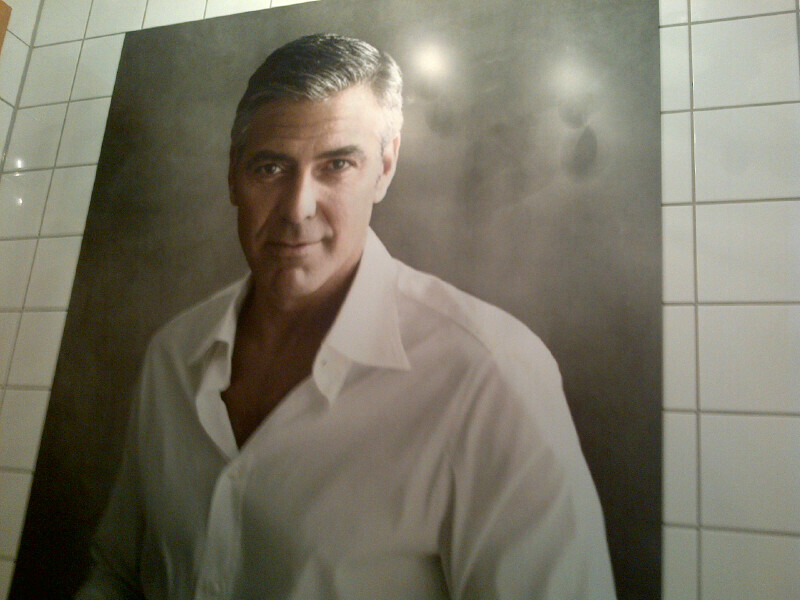 So I went to the bakeries bathroom and opened the door.....You will never believe who looked at me ...George Clooney. I nearly felt sick. I was in shock. There was this pig poster from George in the woman's toilet. See below pic. Was he IN THE STALL with you? Or on the wall? Oh my memory! I love that pic too. I tried to take it off but no chance. I really wanted it for my bathroom LOL. Oh Nicky, loove your sense of adventure. I would put that pic of George on my ceiling over my bed! He doesn't want to lose!! Determined but made a specttacolo of himself...in good humor. But poor horse even more! 3D technology can now replicate food. NASA scientific research aimed at future space travel. Might help resolve world famine too in the future. That would have to be quinoa. Originated in Bolivia. Pseudo-cereal grain as it's high protein. Very nutritious. Preferably coastal. Optimal growing conditions are temperatures that range from 25°F/−3°C to near 95°F/35°C. it's me wrote: Cheap? Easy to grow? This versatility makes quinoa a viable food option for areas with arid farming conditions and high malnutrition rates. FAO estimates that 1 billion people were affected by malnutrition in 2010, nearly all living in the developing world. Bolivia and Peru account for more than half of the annual 70,000 tons of quinoa produced, according to the Food and Agriculture Organization (FAO). While its cultivation is expanding to include Kenya, India, North America and Europe, most of the crop is farmed through traditional means in the Andean altiplano. Andean high altitude ideally. May not be suitable everywhere but versatile. Could be a contributor towards solution. Speeding at almost twice the limit of 80mph, is what caused the train crash in Spain, according to reports. 80 fatalities & many injuries.